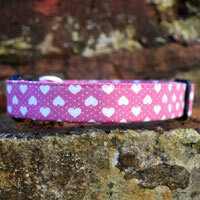 Sorry, matching leads for this design are not available. 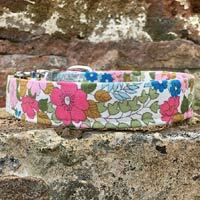 Pretty florals are always a classic and this Floral Silk dog collar has a beautiful vintage feel to it. The retro 60's design is given a modern twist with hues of purple, blue and grey. Beautiful. 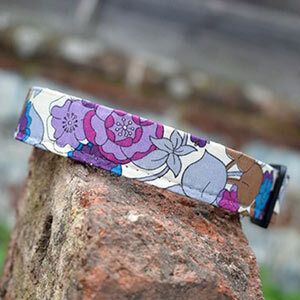 We know you are going to love this unique collection of beautiful British handmade dog collars in a gorgeous range of colours and designs. 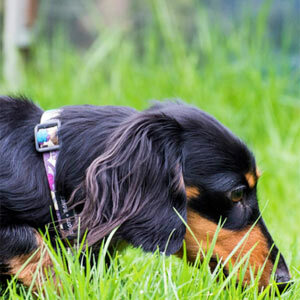 If your dog loves to set trends and wear something unique and snazzy, look no further. Woof! 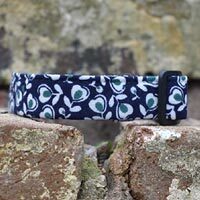 Each collar is lovingly handmade in Devon to the highest quality from some of the most wonderful fabric designs you will find. The patterned outer fabric is a wonderful cotton / silk mix, strengthened inside with a strong nylon webbing core. As the outer is a silk mix, this collar is not suitable for a rough and tumble lifestyle.